Comes with (3) Pitch Pads (3 inches by 1.5 inches) Professional Grade Supplied by the Manufacturer. Place these Pads between the Mounting Screw Tabs and the Wall (or other mounting surface) as to Pierce the Pad with the Mounting Screw as it Penetrates the Wall Surface, Compressing the Pad between the Tab and the Wall as it Tightens for WeatheProof Bracket Mounting to Exterior Surfaces. 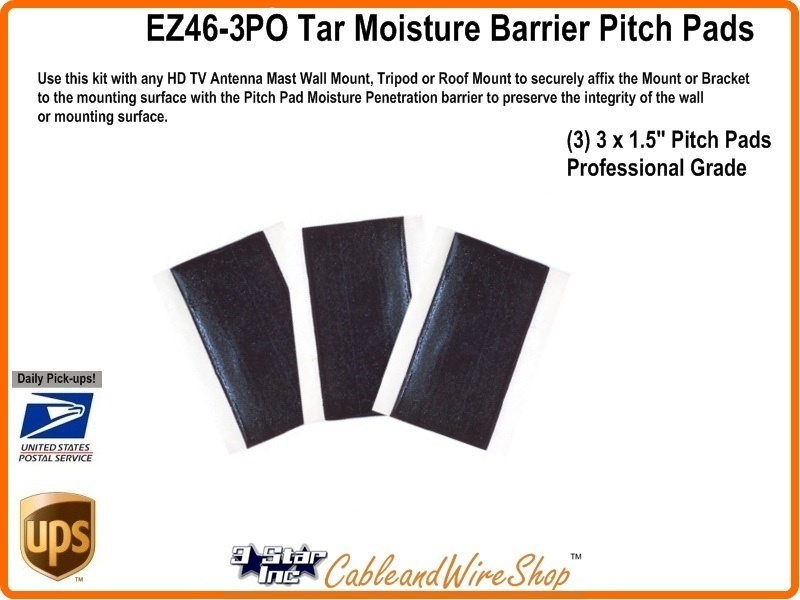 Note: A must-have for any Penetrating Bracket or Mount Installation as the Tar Pitch Pads included in this kit will provide a weather tight seal when applied Properly and restore anti-permeation integrity to the exterior of the premise. Use this kit with any HD TV Antenna Mast Wall Mount, Tripod or Roof Mount to securely affix the Mount or Bracket to the mounting surface with the Pitch Pad Moisture Penetration barrier to preserve the integrity of the wall or mounting surface and thereby WeatheProof Bracket Mounting to Exterior Surfaces. Place them between the bracket and the exterior wall be attached, with the Hole centered and surrounded by the pitch so when the screw compresses the tab of the bracket formed for affixment, the tar is compressed to seal all the way around the hole. The Lag Screws provided in Kits that do include them, typically are of Zinc coating, 2 inches long, 1/4 inch diameter or larger, with integral washer formed with the screw head... making for an easy, secure installation.